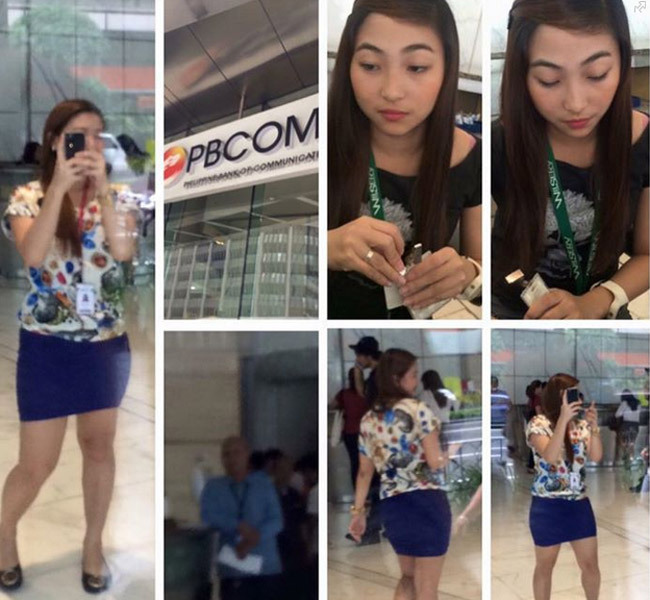 A post on Facebook by Janica Mae Flores narrates her and her friends’ experience on June 15 with the two receptionists and a guard as they applied for a job in PBCom Tower. Several pictures of the three staffs were uploaded on Facebook as Ms. Flores asked the netizens if anyone is able to give their names to be able to file a complaint. As of now, the receptionists were already identified and the management denied that they were under them but of another agency. The two were not allowed to work in the reception for now. According to her story on the post, they were applying for a Casino dealer position to a company located in the said building and then the recruitment agency suggested that they try other companies in the same building. When they were falling in line for the elevator, the two receptionists went after them and told them they were only allowed one transaction per day and asked them why they were lining up on the wrong elevator allegedly in an arrogant and angry way before giving them their visitor IDs. The ‘misbehavior’ of the receptionists and the guard towards them continued when they were back at the reception. The guard gave the applicant’s confiscated ID threatening her that he already photocopied it and she’ll be banned from the building. They continued making fun of them saying that they applied in every floor making the most of their makeup and that they were treating the PBCom building like the Luneta Park. A large number reacted to the post most of which agreeing that the receptionists and the guard’s attitude towards applicants were out of bounds. While the company policies might prove to be true, it should have been said in a polite manner or even post the policies in such a way applicants will be able to see them according to others. There are many comments having the same sentiments on these receptionist. Those who were able to recognize the receptionists and the guard testified to their ‘bad attitude’. This serves as a reminder to act like a professional no matter who one is talking to.